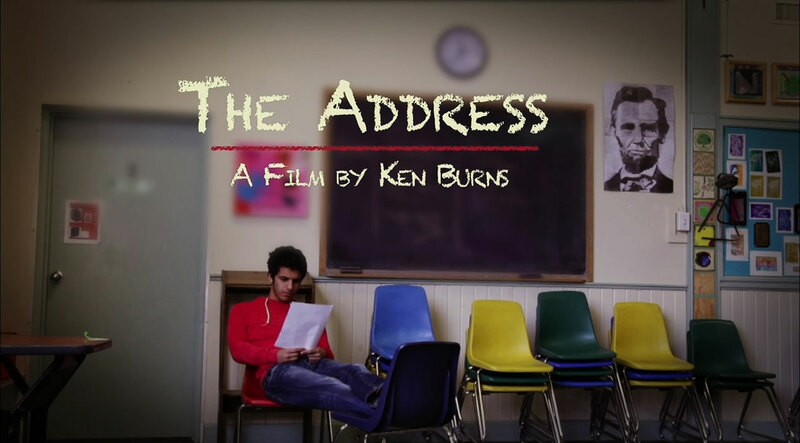 The Address is the latest documentary by the great American director Ken Burns for PBS. The documentary appears to tread on well-covered Burnsian ground by centering on a group of teenage boys who learn to recite Lincoln’s Gettysburg Address over the course of a school term. The documentary is quite different from Burns’ usual style with the lovingly filmed sepia photographs and emotive narrators reading the words of those long past; this documentary employs the students themselves as narrators and explores their present lives. The young men who attend The Greenwood School are not the average student and neither is the school. The Greenwood School is an educational facility which boards teen boys who have a variety of learning disabilities which make them incompatible with rigid traditional schools. These young men have been poorly served by their previous schools and The Greenwood School offers them the opportunity to break old habits, learn in a way that suits their unique and varied learning issues and imbues them with the confidence a traditional school would never offer. As a former special education student in a public school myself, I can attest to the sadness that these students feel when they were picked on by fellow students and teachers for not fitting an unattainable mold of perfection. The Greenwood School strives to provide the boys with respectful instruction, to instill in them the fortitude they need to survive in the world as an adult and to teach them that they can succeed with perseverance and hard work. It is a tradition at The Greenwood School that the students learn to recite the Gettysburg Address, perform it at a gala dinner and receive a coin of accomplishment for their efforts. The act of memorizing and reciting a famous speech may appear easy, but for these students with varying learning disabilities and a lack of confidence, this is a monumental task. The educators at Greenwood use the Gettysburg Address as a teaching tool specifically because it is short, but also one of the most poignant, moving speeches ever written in the history of mankind. By teaching these students who have been repeatedly beat down in their previous educational environments that they can understand and interpret this speech is a brilliant lesson. The rest of the world may have written off these young men, but at Greenwood they are not seen as problems and are encouraged to see the intelligence they possess if they simply work hard and believe in themselves. The documentary has a light quality to it; the boys are filmed romping about in the snow, wrestling and acting as typical kids. The educators lend a warm feel to the school and the film; they are top-notch in their profession and compassionate, as all teachers should be but often fail to become in traditional school environments. Compared to the massive documentaries which Burns regularly produces, this film may seem slight. Instead of a grand American story, the director provides a window into a smaller, but critical narrative about our current lives. The competent education of young people with learning disabilities is crucial to turning out a well-balanced crop of future adults. With ingenuity and perseverance the educators of Greenwood have succeeded in finding a way to instruct those previously disregarded as lesser by those with little imagination. The concise words put forth by Lincoln were to honor the dead of the Battle of Gettysburg; the lasting legacy of the sorrowful yet emboldening prose still reaches into the lives of Americans and changes them for the better.